Attractive 4 bar toast rack. Backstamp: Rd No 623294 This Pattern was introduced by William Adams in 1780 being a copy of a Chinese pattern & one of the first of its style produced in English Pottery Wm Adams England. Crazed otherwise excellent condition. Ovoid base with three solid bars. Light all over crazing otherwise fine. 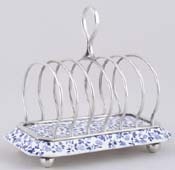 Very pretty little four bar toast rack. Backstamp: Juliet Adams Est 1657 England. Excellent condition. A fabulous five bar rack with border pattern around the rim of the base and snippets of main pattern to the bars. No backstamp. There is a little excess clay on the side of the base of no real significance otherwise excellent condition. With gilt. Fabulous five bar toast rack. Backstamp: Dragon Bishop England. Light crazing otherwise excellent condition. A most unusual ceramic and silver plate toast rack standing on four small feet. Backstamp: Impress EJD Bodley Ivory There is a little wear and discolouration to the base, mainly to one corner, but overall in excellent condition. Dimensions: Base measures 17 cm x 10 cm / Base measures 6.75 ins x 4 ins. Fabulous five bar rack printed in a steely blue. Border pattern around the rim with printed grape detail between the bars. Backstamp: British Scenery Booths Silicon China Made in England. There is a little smudging of the pattern around the rim and a touch of very minor gritty glaze on the top otherwise excellent condition. With gilt. A lovely four bar rack in with border pattern only around the rim with the floral part of the design printed between the bars. Backstamp: Booths Silicon China Made in England and black printed Rd No 728790. A little minor wear to the foot rim and a couple of minor glazing blemishes otherwise excellent condition. With gilt. A lovely four bar rack in with border pattern only around the rim with the floral part of the design printed between the bars. Backstamp: Booths Silicon China Made in England and black printed Rd No 728290. A little wear to the gilt otherwise excellent condition. Lovely four bar rack with ochre rim. Backstamp: Booths Silicon China Made in England Netherlands These Colours Will Not Perish Rd No 728790. Light crazing with a little very minor wear underneath and there is just a tiny loss of glaze and touch of discolouration to one of the bars, overall excellent condition. A most attractive four bar toast rack from the breakfast in bed set. Light crazing otherwise excellent condition. Blue printed Booths Silicon China, Made in England Old blue Danube Rd No 733824 (for the pattern) and black printed Rd No 72890 (for the shape). Five bar rack in this pretty floral pattern printed in a steely blue. Backstamp: Booths Made in England Peony A8021. Excellent condition. With gilt. Backstamp: Booths Silicon China Made in England Real Old Willow. Date of manufacture probably 1935-36. 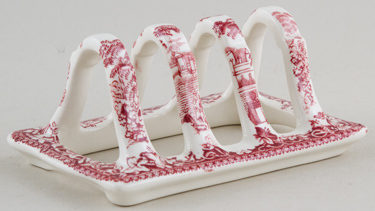 An extremely ornate three bar toast rack. It stands on a decorative foot and has embossed decoration each side of the base. There is a hairline crack to the central bar, otherwise in excellent condition. Provenance: The Entwistle Collection. With gilt. Backstamp: Booths Silicon China Made in England Real Old Willow. Date of manufacture probably 1938-40. A five bar toast rack with a little wear to the gilt and a touch of minor discolouration underneath otherwise excellent condition. Provenance: The Entwistle Collection. With gilt. Backstamp: Booths Silicon China Made in England Real Old Willow and black printed Rd No 728790 and in script 9072. Four bar toast rack from the breakfast in bed set. It has a little wear to the gilt otherwise in excellent condition. Provenance: The Entwistle Collection. With ochre rim a gorgeous little four bar rack with floral detail to the top of the base. From the breakfast in bed set. Backstamp: Booths Silicon China Made in England These Colours Will Not Perish Rd No 723790. Excellent condition. A gorgeous 5 bar rack in this pretty floral pattern. No backstamp. One or two lines of crazing and underneath a little minor wear, overall excellent condition. Burleigh with gilt. Three bar rack with space either side for butter and jam or marmalade. Backstamp: B & L England. The gilt is quite worn and there is a little discolouration mainly to one bar. Overall fine and a lovely unusual piece. Burleigh Willow. A lovely 5 bar rack with border pattern around the rim and small pattern detail each end. Backstamp: Burleigh Ware Willow Burslem England. Light all over crazing otherwise excellent condition. Most unusual piece with gilt rim. Three bar rack with indentations either side presumably for butter and jam or marmalade. Backstamp indistinct but definitely Burgess and Leigh (Burleigh). Minor signs of wear to the gilt. A fabulous large five bar rack. Backstamp: Cauldon England. Excellent condition. With gilt. This is a fabulous five bar rack with the border and flower detail from Dragon pattern. Backstamp: Cauldon England Est 1774. There is some wear to the gilt around the base. Also to the base is a hairline and another tiny one at the base of one of the bars. Overall a lovely display piece. With gilt. An unusual rack with oval shape bars. Backstamp: Cauldon England Est 1774. Light crazing, with a hairline to one bar and some areas of excess clay, mainly to the base. Overall a lovely piece. An absolutely gorgeous three bar toast rack with gilt. One of the bars has a hairline crack otherwise this is in amazing condition amd shines like new. Blue printed backstamp Cauldon England Esd 1774. Brand new and first quality china, which is dishwasher safe. This item has been discontinued by Churchill and is no longer available. Blue printed Hawthornden design to base, with black rim and gilt decoration. Bars white with gilt decoration. Has been broken and extensively restored in the past, fine as a display piece. A sweet small three bar toast rack in china. Blue printed floral decoration with generous gilt decoration. By Charles Ford of Hanley, Staffordshire. Blue printed backstamp Ford's China, swan with CF monogram and England. A lovely five bar toast rack. No backstamp, but almost certainly Gibsons. Some discolouration underneath otherwise excellent condition. This pattern also known as Onion pattern. Light crazing but it does not detract from this most attractive toast rack. Grimwades Ye Olde Willow pattern. A three bar toast rack with light all over crazing and a little associated discolouration in parts, particularly on the back. Lovely dove detail either side of the central bar. Blue printed backstamp. Fabulous, very unusual toast rack with castellations to the pierced bars. The base is decorated with rose design. Castle is the name we have given the design, although Castellated House would also be apposite. 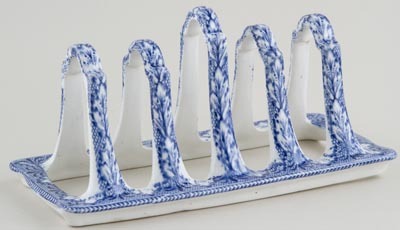 A similar toast rack was featured in the True Blue Exhibition in 1998 and was marked with a blue printed H, believed to be for William Hackwood of Eastwood, Hanley active 1827 to 1843. No backstamp. Featured on pages 59 and 101 of the True Blue Catalogue. Underneath the rack there are two rim chips and a little minor damage to the foot rim. There is some pitting and loss of glaze to the castellations but overall this is a fabulous piece. Not marked, but definitely Hales Hancock and Godwin Aquila. Ochre rim and line decoration to bars. This five bar toast rack has a small build up of glaze at one end, otherwise it is fine. Five bar rack. It has a little light crazing with some staining but this is mainly underneath! Otherwise absolutely fine. A lovely three bar toast rack. Backstamp: Abbey 1790 England G Jones & Sons. Excellent condition. Delightful three bar rack. Backstamp: Abbey 1790 England G Jones & Sons. One or two very minor blemishes otherwise excellent condition. Fabulous five bar rack. Backstamp: Abbey 1790. There is a little excess blue on the base plate and underneath there is a little wear to the foot, otherwise excellent condition. One of the Abbey rarities, the toast rack, here in the five bar version. Decorated with the border design to the foot and with blue lines and dots to the bars. This is as near perfect as they come. There is a minor stress crack, occuring in manufacture, at the base of one bar and the occasional tiny line of craze in the glaze! Really wonderful condition. Blue printed cartouche wth Abbey 1790 and England, G Jones & Sons. Five bar toast rack with gilt. A little minor light crazing otherwise superb. This is a lovely toast rack. Blue printed backstamp Dragon, Crescent over monogram, with George Jones & Sons, England beneath. Three bar toast rack with gilt rim and gilt highlights to the bars. Four very small minor stress cracks, but they really are not very noticeable. With gilt. Backstamp: Old Foley James Kent Ltd Staffordshire Made in England 5663. Touch of crazing and the gilt is worn otherwise fine. Fabulous five bar rack with border pattern only. Backstamp: Cetem Ware Made in England. There is a little wear to the tips of the bars otherwise excellent condition. Four bar toast rack with hues of green, blue and brown. Backstamp: Masons's Ironstone Made in England Fruit Basket Permanent Detergent Proof Decoration. A little minor crazing to the glaze, otherwise excellent condition. Four bar toast rack in superb condition. Four bar toast rack in this pretty floral pattern. Backstamp: Masons Manchu England Guaranteed Permanent Acid Resisting Colours. Light crazing otherwise excellent condition. Four bar rack in lovely condition. Blue printed Masons above the crown and Regency. England C4475 Rg No 821349 in Gt Britain, Guaranteed permanent & acid resisting colours. A lovely three bar toast rack. An earlier example of this pattern with the pattern printed slightly paler than later items. Backstamp: Mason's Regency England C4475 Rd No 821349 in Gt Britain. Light all over crazing otherwise excellent condition. Provenance: The Pool Collection. 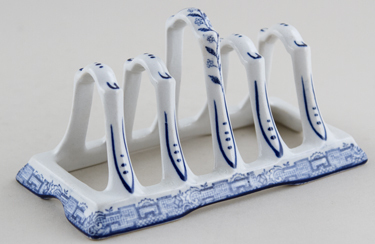 A very pretty four bar toast rack. beautifully decorated. Backstamp: Masons's Patent Ironstone China Strathmore Made in England C4792 Rd No 836741. Excellent condition. Delightful four bar toast rack beautifully patterned all over. Backstamp: Mason's Vista England Guaranteed Permanent & Acid Resisting Colours Excellent condition. Delightful four bar toast rack in pink and white. With gilt. This small toast rack is in superb condition with the gilt beautifully intact. It would have been part of the breakfast in bed set. Bone china with gilt. A gorgeous and quite ornate toast rack with moulded side handles. Backstamp: Mintons England, impressed Mintons and date cypher for 1911. Minor wear to the gilt and a small stain by the willow tree otherwise excellent condition. Queens by Churchill China. Tilly is part of their Caravan Trail range. Brand new and first quality china, which is dishwasher and microwave safe. This item has been discontinued by Churchill and is no longer available. Lovely little three bar toast rack. Backstamp: Royal Doulton Made in England Norfolk Rd No 251612 Rd No 587783. One end has been restored otherwise absolutely fine.